July 13th 2017. 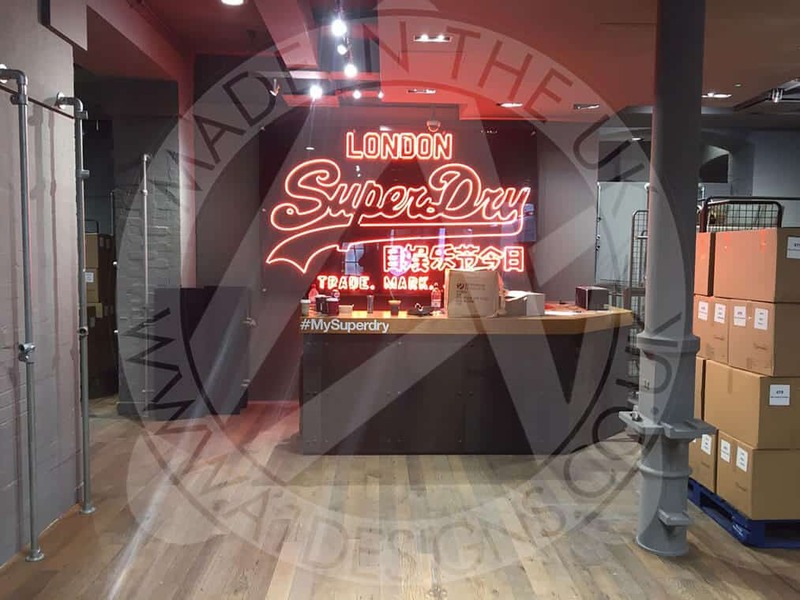 We received an order from one of our clients for three new Superdry neon signs for a new store opening up in London’s Covent Garden. 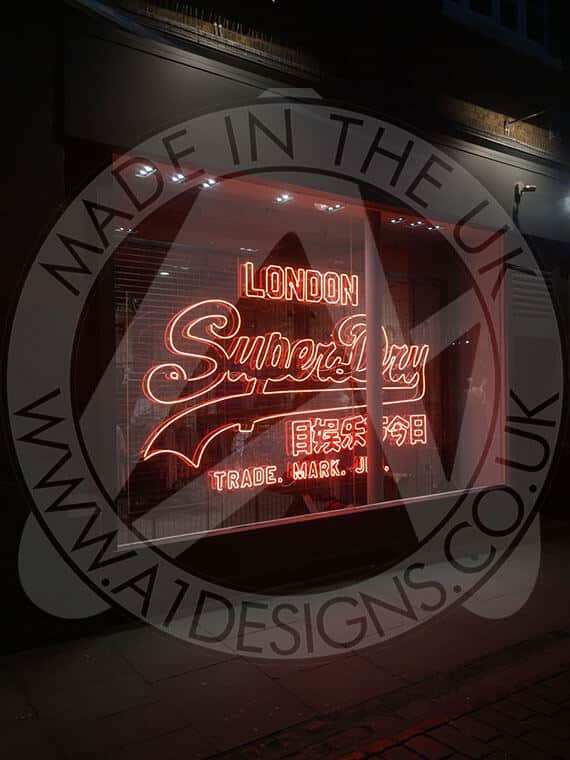 They were to display the Classic Superdry Trademark Japan Logo, with additional text above reading London. Two of the signs were to be 3.6 meters wide and 2.13 meters high while the third needed to be 2.75 meters wide and 1.67 meters high. The smaller neon sign was to be mounted onto a tray panel which would then be put up onto a wall, standard stuff for a company who assemble neon signs onto tray panels all the time. The two large signs however were going to be mounted onto clear acrylic panels and then onto portable mesh panels. There was a twist however, these panels had to stand off of the mesh panels by at least 25mm. While this was a little trickier than the tray panel version, we have never been a company to shy away from a challenge. As it turned out there was a bigger challenge than suspending 10mm thick acrylic panels holding approximately 55 meters of glass tubes on each sign, all three had to be made and installed by the end of the Thursday 26th July ready for the shop to open the end of that week. 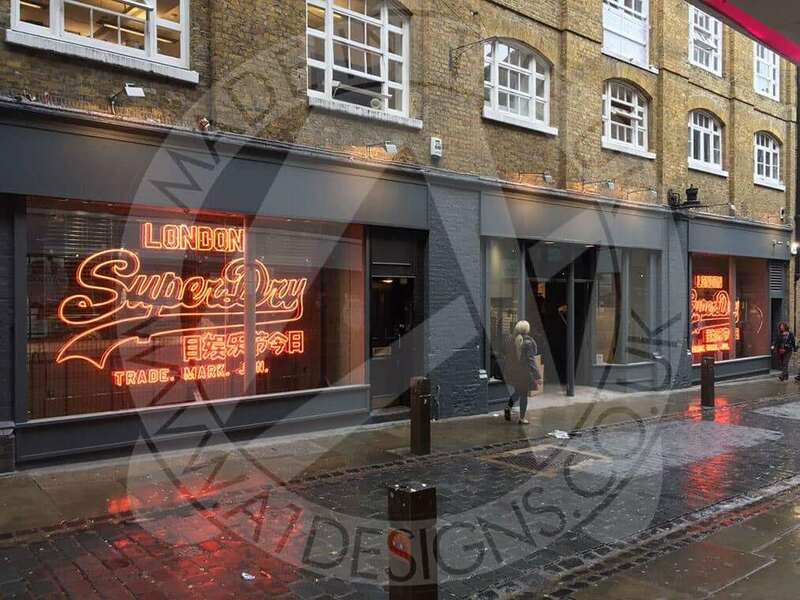 With a full workload, a standard medium sized neon sign will take about 5-10 working days to be made once all artwork has been agreed, we had 9 days to make and install almost 150 meters of glass. It was no easy feat, with each tube having to be hand bent over a hot flame and the design calling for double line neon, that is, neon that follows the outline of a shape rather than the central line of it. Once bent, every single piece of glass then has to have a pair of electrodes attached that then allow electricity to run through them before then pumping them with the neon gas that would then light up. It took four people working in the glass shop to bend, electrode and pump approximately 100 individual pieces of glass, over two full weekends and 5 additional working days, just to have the neon signs ready to assemble onto their respective panels before they were transported to Covent Garden. It then took another 4 people to prepare each panel, mark out the drawings and then assemble the neon ready for transport. The installation of the signs took place over the 24th,25th and 26th July, with three people working approximately 13 hours a day to ensure we met the deadline, but by Lunchtime on Wednesday 26th, all three neon signs were mounted and turned on. This project took a combined total of approximately 500 hours from start to finish, but we pride ourselves on meeting a deadline once we commit to it and with all of our signs being manufactured in house, we can often meet tight deadlines that would otherwise result in a client not having a neon sign when they needed it. And the result of our efforts? Well we think they turned out pretty well. But don’t take our word for it, take a look at some of the photos below and decide for yourselves. Big or small, A1deSIGNS can help you with your signage needs. Whether it is a complex project or a tight deadline, if it is possible, we will do everything we can to help you get your neon sign. So drop us an email, or call us today to get the ball rolling on your next project!